Seriously cool library, velvet smooth & pretty damn groovy too. You really get that "underwater" feeling on a lot of the tracks, kinda like being immersed. It's definitely going to appeal to fans of contemporaries (such as Jean-Pierre Decerf & François De Roubaix) as well as more recent acts (there's plenty here for AIR fans to enjoy). The highlight for me is A2 ("La danse des Méduses"). I'm so glad that this LP got a reissue, as you can expect to pay hundreds for a half-decent original press. How does this reissue sound? Fantastic. Obviously I haven't heard the original vinyl (only a really crackly rip from an old blog), but this pressing delivers. With regards to the surface noise mentioned below (pops, ticks etc), mine is pretty clean. After a VPI it plays around 98% perfect. Sure, there's a few small pops but most of this material is light so you'll pick up a lot more than, say, a Metallica LP. It'd be cool if this label reissued some more ultra rare Library. May I suggest something a bit more modern & electronic, but equally awesome? Accélération (check out "South Of The Border"). Am I the only one getting a looooooot of pops/crackle/noise throughout the record ? Very disappointed by the quality... was it ripped from another record ? Reissue is happening and it'll be available next January. Mode music featured on this record has been really intriguing to me, it has this attribute of taking you to the –from now– remote past. I felt emphaty regarding how a Vinyl Factory article stated some of its tracks as medieval electronica. this album is bleeding for a reprint. one of the best library listens ever! I keep discovering obscurities that just simply blow me away, and L'univers de la Mer from Dominique Guiot is a great example. This album first appeared in 1978 on the Chicago 2000 label, with artwork from Jacques Wyrs, same artist who brought us Eloy's Floating, Ange's Le Cimetière des Arlequins, and Klaus Schulze's Picture Music, the 1974 reissue of Larry Coryell's Spaces, amongst others. In 1979 it was reissued on the Auvidis label with a new cover (that includes a small excerpt in a small circle on the lower right hand of the original Jacques Wyrs artwork). It appears that Auvidis is simply the successor of Chicago 2000 (the Auvidis releases still bear the "Chicago 2000" name on the back cover even well into the 1980s), but when you deal with obscure library music album labels like this (Chicago 2000 and Auvidis doesn't have the recognition amongst library music enthusiasts as say, KPM Music), I am only second-guessing. 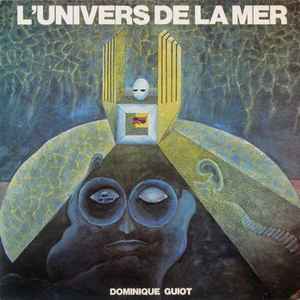 I don't know much about Dominique Guiot, other than he's French, and he continued recording library music albums through the 1980s, but one opinion started his 1980s albums were disappointing compared to L'Univers de la Mer (probably because they were too '80s for that person's taste). What you get is great instrumental electronic/prog rock full of Mini-Moog, guitar, clavinet, and Mellotron, a little organ. I can't believe I found such an obscurities full of Mellotron like this. I also don't blame Andy Thompson if this album escaped the radar scope of his Planet Mellotron website. I've heard descriptions of everything from a more electronic Mike Oldfield right down to Goblin. I should also add on it reminds me of SFF (Schicke, Führs, Fröhling), as there's that symphonic feel that goes with it, but Dominque Guiot managed 98% of this album all by himself, except for the sax on one cut, and one synth solo. "La Danse des Meduses" has that synth bass rhythm that gets me thinking of Jean Michel Jarre's "Equinoxe V", but then it ends with some King Crimson-like Mellotron, one of my favorite Mellotron moments on this album. "Les Pingouins S'Amusent" features some really nice clavinet and Moog. The rest of the album is also great electronic/prog. It's too bad it was released as a library music album and not sold to the general public, this album really deserves to be in your collection. How did such an album escape my radar scope? It's easy! Because, aside from the 1979 Auvidis reissue, this was never reissued (no CD reissue, since the only reissue came during the vinyl-era). Plus library music albums do provide lots of hidden gems if you look far enough, and for all progheads into electronic and symphonic prog need this album. If you can find a copy, that is. Underwater Library Music by MillionDollars. *H20 List* Rain, Water, Ice, Snow, Mist, Clouds & Fog Themes by LeslieVanHouten.